TE buffer is composed by Tris, a buffering agent and EDTA, a chelating agent. EDTA has the ability to prevent degradation of DNA and RNA by chelating magnesium- or other divalent metal ions.Tris-EDTA-based solutions break protein cross-links and can therefore unmask antigens and epitopes in formalin-fixed and paraffin-embedded tissue sections. Treatment with TE buffer enhances the staining intensity of antibodies in the immuno-histochemical detection of certain proteins. 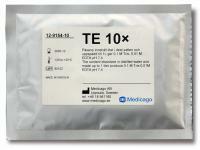 Medicago’s TE buffer is supplied as exactly pre-weighed powder in pouches, giving 1000 ml of 0.1 M Tris-HCl, 0.010 M Tris-EDTA buffer with pH 7.4 at 25°C when dissolved in nuclease free water or deionized water. Empty one pouch of the TE buffer in a laboratory flask or beaker placed on a magnetic stirrer. Add 300 ml of deionized water and stir the solution for a few minutes. Adjust the volume up to 1000 ml, stir until full dissolution and the buffer solution is ready to use. TE buffer is shipped at room temperature. Store the pouches in a dry place at room temperature. Shelf life is three years after production date.